The apartment has full central gas heating. The accommodation comprises of a bathroom, kitchen dining area, living room and bedroom with one double bed but can sleep two on single beds. The bathroom has a walk in wet room shower toilet and basin with heated towel rail. The kitchen has a full size electric oven 4 ring gas hob under counter fridge with ice box and washer dryer. Dining table that seats 4 people and is fully equipped with magi mix coffee machine kettle & toaster . The living room has a TV with DVD. Free satallite TV, iPod docking station & wireless broadband internet connection. Perinaldo: The village: Perinaldo has a post office with a cash point; pharmacy; mini-market; bakery and a choice of bars and restaurants. Local culinary specialities include (artichokes); olive oil (made from Taggiasca olives); dishes made with cinghiale (wild boar); Rossese wine. It is a quiet village but hosts a number of summer festivals throughout the year and many in August. The village is surrounded by some fantastic countryside offering some challenging hiking and mountain biking opportunities. Further a field: Inland, the villages of Dolceacqua with it's castle and bridge painted by Claude Monet and Apricale are a short drive away. Pigna, with its thermal spa, and the ghost village of Bussana Vecchia are a little further Bordighera offers a touch of class and a blue flag beach! Close by in the hills behind is the ancient principality of Seborga. Ventimiglia offers an abundance of shops, restaurants and bars and its world famous Friday market. The Hanbury Gardens at Mortola and caves at Balzi Rossi, both very near the French border are just a 25 minute drive. Ski: Limone Piemonte, Hiking cycling and off road sport. France Monaco and beyond: Menton Explore the treasures of the Côte d'Azur stretching from Menton in the east to San Tropez in the west. Menton, host to the lemon festival each February, is known as the 'Pearl of France' and is thought by some to be without a peer! A little further along the coast past Roquebrune and Cap Martin is Monte Carlo home of the casino, the Grimaldi Royal Family and the Monaco Grand Prix! Next is Cap d'Ail with the villages of La Turbie and Eze behind in the hills. Taking any of the three 'Corniche' you can reach St Jean Cap Ferrat, former home of countless movie stars and singers and the location of the magnificent Ephrussi de Rothshild Villa. Next up is Nice, then Cannes. The apartment is amazing, everything you need and more from a holiday home! It is extremely well-equipped, there was nothing we needed but didn't have to hand. Perinaldo is a lovely village with cobbled streets, friendly locals, at least 2 excellent restaurants and a wonderful view down to the sea! Steph was very helpful without being intrusive and was happy to answer any question. A great base for visits to Monaco, the Ligurian coast, France and the mountains. It really is as good as the advert says it is! Hi Chris thankyou so much for taking the time to write a review. its good to get feed back. Sehr schöne kleine Ferienwohnung abseits in den Bergen von Italien. Die Wohnung ist sehr Geschmackvoll eingerichtet sodass man sich schnell wohlfühlt. Der Kontakt zu den Vermietern ist sehr nett. Der Blick aus dem Wohnzimmer und Schlafzimmer Fenster ist atemberaubend. Die Wohnung liegt mitten in den kleinen Gassen vom Dorf. Es ist sehr urig. Ein bisschen anstrengend sind die Wege, da alles irgendwie bergauf geht 😃. In dem kleinen Dorf ist ein Supermarkt wo man den täglichen Bedarf mit abdecken kann. Es gibt einen Bäcker und ein kleines Geschäft mit Wurst und Käse. Die meisten Restaurants waren leider geschlossen. Es gibt noch ein Hotel im Dorf, welches von Deutschen bewirtet wird. Dort kann man auch essen und sich ein paar Tipps holen. Am Anfang des Dorfes gibt es eine kleine Bar die sehr belebt ist. Ebenfalls mit super Blick in die Berge. Die Wohnung eignet sich auf jeden Fall für einen ruhigen erholsamen Urlaub. Was allerdings Bedacht werden muss, ist das die Strecke aus der nächsten Stadt zum Dorf rauf ca 25 Minuten dauert und durch die Serpentinen führt. Es gibt viele sehenswerte Orte im Umkreis. Dolceaqua mit seiner Altstadt....Sanremo mit vielen Einkaufsmöglichkeiten....Monaco ist auch nicht weit und ein Besuch auf jeden Fall wert. Im großen und ganzen super schön und erholsam. Sehr gut eingerichtet. Es fehlte an nichts. Steht such zu,m verkauf. Die Wohnung hat uns sehr gut gefallen. Sie liegt mitten im Ort und man kann alles gemütlich zu Fuß erreichen, der nahe gelegene Bäcker bot viel mehr als Brötchen an. Die Wohnung ist sehr geschmackvoll eingerichtet, modern, sauber und gepflegt! Es fehlte an nichts. Alles war so, wie im Inserat beschrieben. So konnte man selbst die Schlecht-Wetter-Tage entspannt in Perinaldo verbringen. Wir haben uns sehr wohl gefühlt. Auch die Kommunikation mit den Vermietern lief reibungslos und sie gingen auf all unsere Wünsche ein, einfach perfekt und sehr seriös! Das Auto konnte man auf einem nahe gelegenen Parkplatz - 5 Minuten Fußeweg - abstellen. Das Örtchen Perinaldo mit der gemütlichen Wohnung trohnt auf dem Berg nicht weit von der Küste entfernt. Von hier aus kann man sowohl Sanremo als auch die nahen Orte Ventimiglia und Bordighera sehr gut erreichen. Dort ist man am Meer, hate viele Bars, Restaurants und gute Einkaufsmöglichkeiten. Selbst die französiche Seite bietet mit dem nahen Menton und Nizza tolle Ausflugsziele. Wir können diese Wohnung uneingeschränkt weiterempfehlen! It was a really unforgettable stay in this wonderful historical location. The apartment is exactly beautiful as shown on the pictures. Perinaldo is perfect, if you want to relax 100% and to feel original traditional italian attitude to life. Perinaldo is a mediaeval village in the Province of Imperia in the region of Liguria. The village is located on a ridge in the hills about 15 km from the nearest blue flag beach at Bordighera. Perinaldo, the birthplace of the 17th century Italian astronomer Giovanni Domenico Cassini and with it's own observatory, commands fantastic views south down the Vallecrosia to the coast and north to the Alps. The nearest airport is Nice at a one hour drive. Nice is one of the best airports in Europe and is served by Easyjet, BA and Ryanair with exceptional road access and car hire facilities. 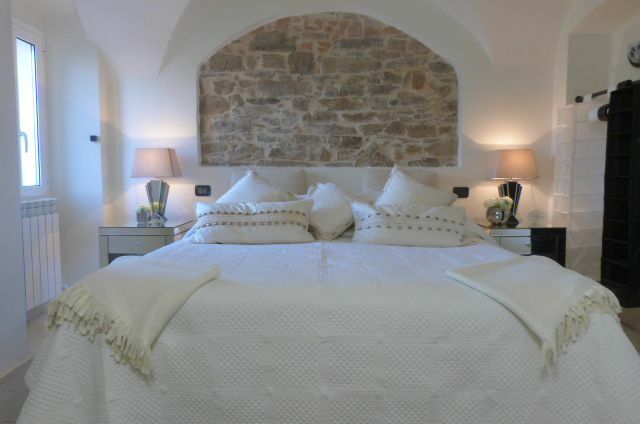 This former bread oven in the ancient village has been transformed in to a luxury one bed apartment. It has all the modern facilities.